Château de Chantilly is in full swing ! Château de Chantilly is going through fascinating times and the official inauguration of the Petits appartements was a true family event with very prestigious good fairies. First, the new director of the Foundation, Fériel Fodil, is a beautiful young woman who worked on the Louvre Abu Dhabi for eight years and she conducted the ceremony with authority and great charm. 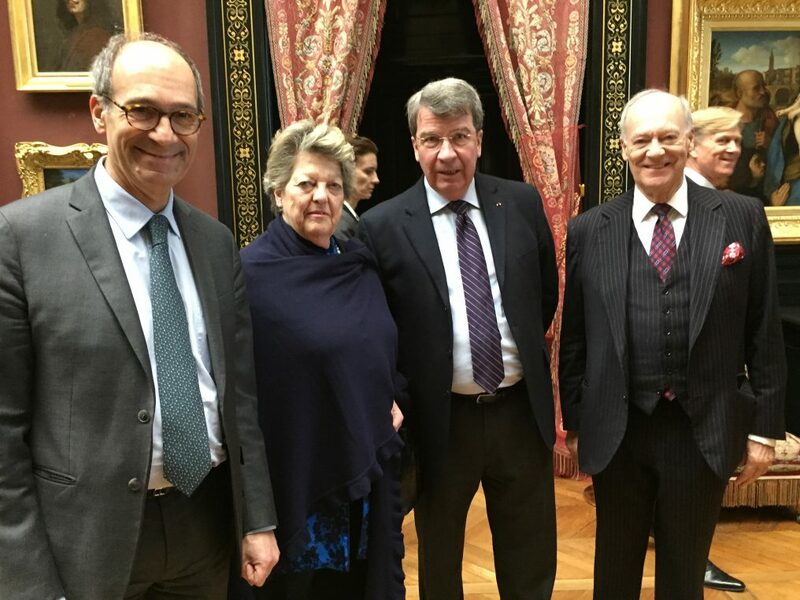 Then Xavier Darcos, chancelier of the Institut and former Education minister, spoke with optimism and energy about the evolution of all of the Institut’s castles and properties which include Giverny and Jacquemart André. Third, Prince Amyn Aga Khan expressed his passion for Eugène Lami‘s talent in decorating Duc d’Aumale’s private wing. His brother, the Aga Khan, has created a Foundation to develop the Domaine de Chantilly. Princess Chantal de France with her husband François Xavier de Sambucy de Sorgue were accompanied by their nephew Jean d’Orléans, Comte de Paris, who would be king if France was not a Republic. 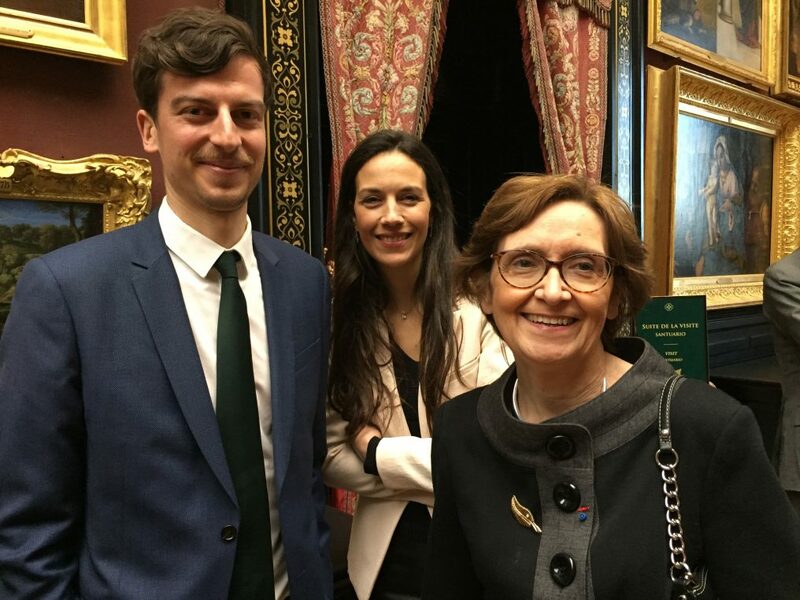 Both curators, Mathieu Deldicque, who was in charge of the renovation of the apartments and Nicole Garnier, who has reigned over Chantilly for the past thirty years, were excited to welcome their new director, Fériel Fodil. 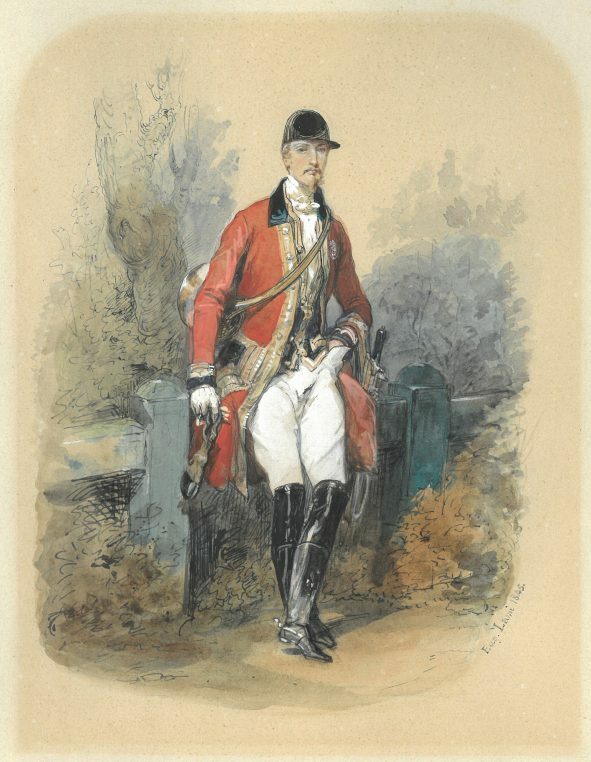 An exhibition of Eugène Lami’s watercolors precedes the visit of the apartments and one understands how this amazing artist could have become the drawing teacher of King Louis Philippe’s children. 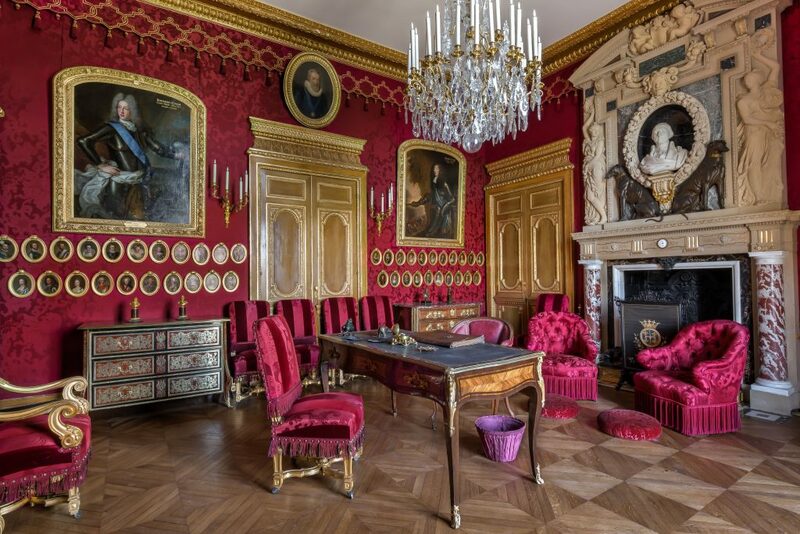 After travelling to England, and discovering lavish country estates, Lami oversaw the decoration of Palais des Tuileries (now destroyed) for the King, and this is how Duc d’Aumale decided to hire him for the modernization of Chantilly. 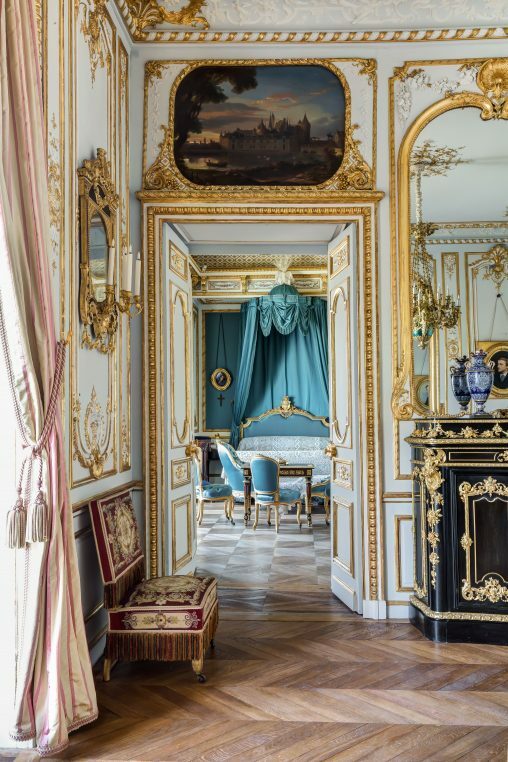 He created two lateral apartments, one in neo 18 th century style for the Duchess, with white and gold panelings, blue silk, and ceilings painted by Diaz de la Peña. 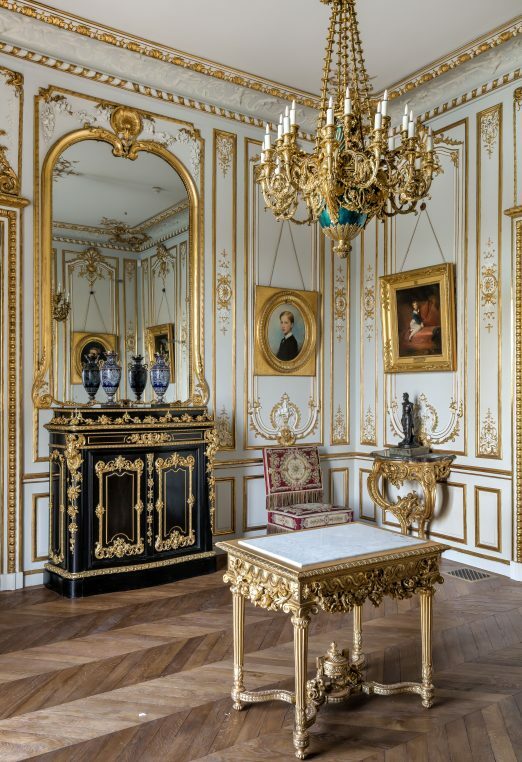 The little Singerie painted by Christophe Huet in the 18 th century remained in the central part and on the other side, the Duke’s apartments with Boulle and neo Boulle furniture are both austere (for his bedroom) and lavish for the Salon de Condé. Great comfort is used in the bathrooms and lighting and heating were produced by gaz. What Henri d’Aumale and Lami achieved is a total Oeuvre d’art with a dialogue of periods as Prince Amyn reminded us, even though or maybe because there is no unity in style. 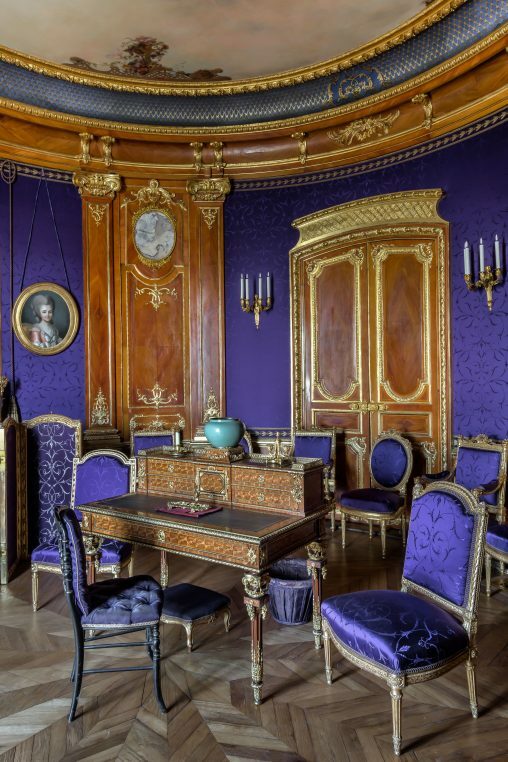 Each piece of furniture and fabric was chosen with care, and the successive Princes de Condé, owners of Chantilly for three centuries, are remembered through small medallions. A fantastic bureau à cylindre by Jean Michel and Guillaume Grohé comes out as does the furniture covered in red silk and velvet, which will later inspire the Rothschilds for their castle of Ferrières. This is still called “le style Rothschild” today and decorators such as Vincent Fourcade used it in New York in the 1970’s. The three year long restoration was financed partly by private donors including les Amis du Musée Condé and the Friends of the Domaine de Chantilly, and by the Foundation and the Institut de France but also by the state. There are many events taking place in Chantilly this year: “Les Journées des plantes“, a lovely garden festival, on May 17 to 19 attracts plant growers from Belgium, Great Britain and France. An exhibition around “La Joconde nue” (naked Mona Lisa) from June 1 to October 6, will seduce all Leonardo da Vinci admirers and a week end of music in the fall will take place in the Grandes Ecuries. Next year, a “Meissen and Chantilly: Princely porcelains” exhibition will start in September 2020. The scenography will be designed by Peter Marino who was the architect for the modernisation of the Dresden Museum. For the first time August der Starker and Louis IV Henri de Bourbon Condé‘s collections will be united and it is surprising to see how many similar pieces Meissen and Chantilly manufactured in the 18 th century. Chantilly is 20 mins by train from Gare du Nord, an hour by car from central Paris. The Eugène Lami exhibition is on till May 19 th.